For the well-being and safety of all those living in and using your spaces, make the choice of perfect hygiene. Sterilizing and cleaning your surfaces with Bluetoo® guarantees the total destruction of microorganisms, germs and bacteria, confirmed by a visual indicator that is unique in the world. Bactericide with 99,999% effectiveness, active in the fight against nosocomial infections (against Staphylococcus auréus, Eschérichia coli, Pseudomonas aeruginosa). Tested by a Microbiology and Virology laboratory. European Standard NF EN 1040. Ready-to-use solution: 5L container in box of 4, with 1 spray bottle and 1 spigot/tap included. 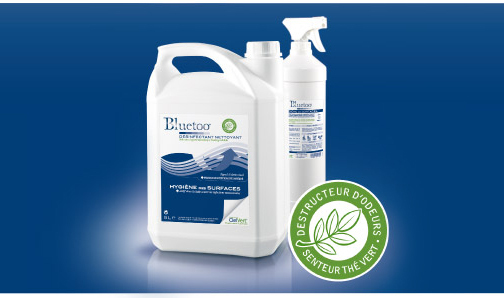 Bluetoo® may be diluted by up to 1% and still preserve its full disinfectant properties on Staphylococcus auréus, Pseudomonas aeruginosa, Escherichia coli (no coloration & discoloration in this case). Bluetoo® is more typically used with a spray bottle that includes a nozzle equipped with 2 spray systems, but it can be used with larger model pump sprayers when the product is being applied to much larger surfaces. This product is not subject to hazard labelling. Mixture of natural cleaning salt and non-ionic surfactants, disinfecting agent. External use only, for all surfaces requiring disinfection due to contact: sanitary facilities, common areas, floors and walls, office furniture and rooms, professional instruments and implements, transport accessories, public places: counters, handles, handrails… Avoid contact between the product and the air; ensure the container is closed properly after using or decanting. Use biocides with precaution. Before any use, read the label and the information concerning the product.